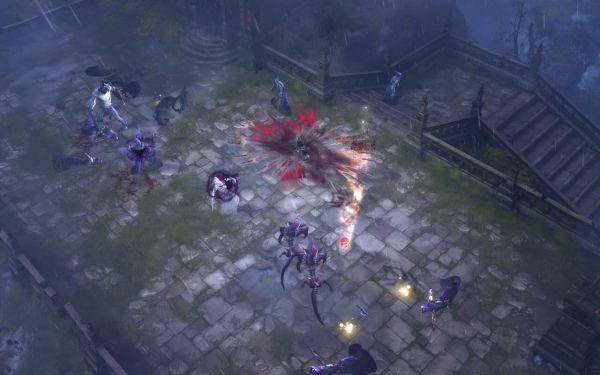 Bashiok must have a real life weekend planned, since even though the Diablo Facebook page was only at 895k on Saturday afternoon, he sent out the fifteenth batch of artwork. 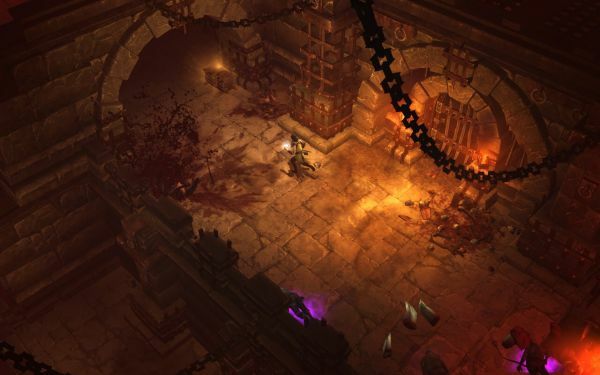 We’ve got three images this time, two new(ish) screenshots, plus a great piece of Diablo artwork. The artwork is by Glowei, it was used on the BlizzCon 2010 poster, appeared as the King of Hearts in the Diablo Poker Set (closer look = no), and was released in full quality last December. Now we’ve got it again, in even higher quality. Click the thumb for a better look. The screens show off two of the areas we played through in the Blizzcon 2010 demo. The red-lit torture level was actually called the Halls of Agony, though the name of the ghostly green jail level, “King Leoric’s Torture Chambers” seemed a much more apt name for it. In this shot we see a male Wizard, orb glowing in hand, running away from the carnage he’s created. Monster parts! The other shot is from the short outdoor area featured in the Blizzcon demo. It was called the Highlands Passage, and in one of the picnic area cul-de-sacs, we’ve got a Demon Hunter working her way through plenty of beasties, with the aid of Fan of Knives. Click the thumbs to see them larger-ed.